The Sun is shining and the weather is sweet. Yet not everything that comes with the Summer is ideal. With street harassment and warmer temperatures on the rise, the mass shootings on California campuses, and other manifestations of heteronormative patriarchy we encounter – We believe it is vital to come together and cultivate ourselves. Through light activities and learning hands-on-ways to decolonize our diets at a farm, Cultivation will leave all of us with tools to continue to grow as people but as a movement – through planting seeds and making connections with one another. 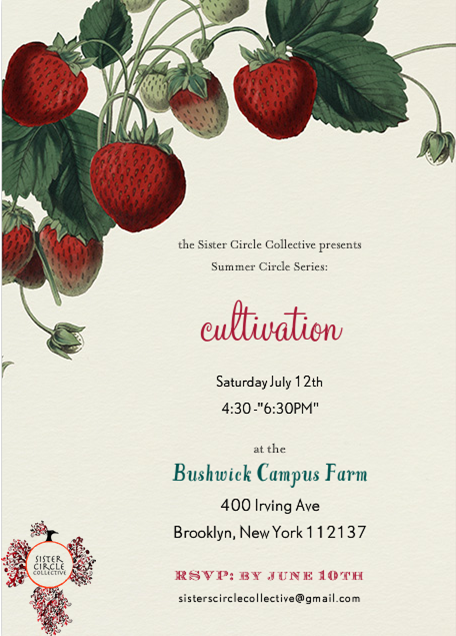 *RSVP by July 10th at sisterscirclecollective@gmail.com we need an accurate head count for the activities.